In October 2013, the Desert Research Institute, UC Davis, and University of Nevada at Reno released the Lake Tahoe Nearshore Evaluation and Monitoring Framework Report (Report) (NeST 2013). The Report presents a conceptual understanding of nearshore environment processes, assesses the heterogenic nature of the nearshore, highlights the lack of data available to characterize the environmental status of the Lake Tahoe nearshore, and emphasizes that current agency implementation efforts will benefit the nearshore environment. 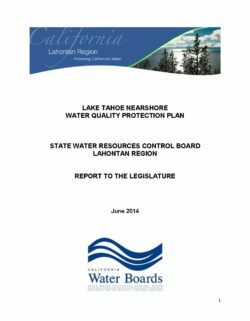 This Lake Tahoe Nearshore Water Quality Protection Plan (Plan) outlines the Lahontan Regional Water Quality Control Board’s (Regional Water Board) response to the changes in the Lake Tahoe nearshore environment as informed by the Report. (5) assess the need for revised or new water quality standards to protect nearshore water quality. In establishing and maintaining nearshore water quality protection policies, the Water Board will continue to coordinate with other government agencies and the public. Because available resources are insufficient to fully implement all recommendations, a dedicated annual funding source must be found to adequately protect and enhance Lake Tahoe’s precious nearshore. The Plan elements and funding needs are presented in Attachment 1. The Plan also serves as response to a Legislative request in the 2012-2013 Budget Act specific to the Water Board’s approach to the nearshore.